Pedestrians. 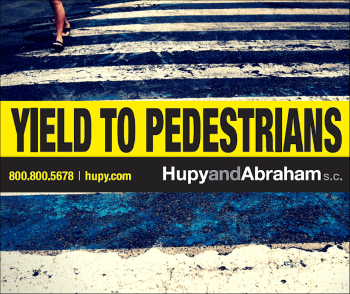 Police Don't Enforce Right Of Way | Hupy and Abraham, S.C. While pedestrian deaths rose an estimated 10 percent nationwide in 2015 according to the Governors Highway Safety Association, it was much worse in Wisconsin, where pedestrian deaths rose by 22 percent per the Wisconsin Department of Transportation. With gas prices dropping, motorists logged more miles than ever in 2015. But the extra driving didn’t correlate with extra mindfulness of pedestrians. Pedestrian deaths have been rising since 2005 and now account for 15 percent of all traffic deaths. After seeing another person killed near 14th & Atkinson, I feel compelled to address this matter yet again. For years, I have been urging local authorities to take pedestrian awareness more seriously. Each of the past three years, I’ve written letters to all 19 metro-Milwaukee police chiefs and mayors, demanding that those who violate pedestrian right-of-way laws receive citations. Shorewood was about the only municipality to give a meaningful positive response, saying they already enforce these laws. Once motorists start getting citations for putting lives in danger, things will move in the right direction. But according to the Wisconsin DOT’s latest report, pedestrian fatalities are on pace to rise again in 2016. Many drivers don’t understand that they need to yield to pedestrians at all corners and crosswalks. Some drivers do know the law, but don’t follow it because it isn’t enforced. Even county buses and city police vehicles don’t always follow the law. I am saddened by the number of pedestrian deaths occurring each year, and it saddens me further to see this number rising each year. As a leader in the community, I will continue to do all I can to raise awareness regarding pedestrian rights, including running public service announcements on television in Wisconsin, Illinois and Iowa telling motorists to yield to pedestrians.